Hello everyone i am looking for schematic to start a 6j6 paralleled preamp,any help will be appreciated. 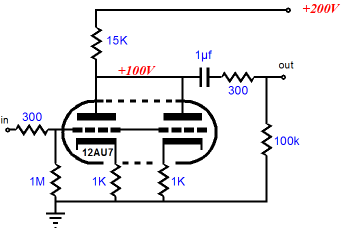 Not sure why you want to draw the schematic with a inverted output signal. I normally just draw most single stages like this as inverting. Unless you're including it inside a feedback loop, it really doesn't matter. The neat feature of this one is if you match the 50KΩ load resistors, you can get two outputs 180º out of phase. This is a handy feature for some circuits. I always like to have the piece of mind that my audio signal isn't inverted. I also noticed that the second triod is grounded by a 50k on the grid. This means if we were to take the output of from the other triode so is non inverting then the voltage gain would become small or very small. If we were to take the output as inverting as current schematic, then I think the second triod won't be acting much in the schematic. As the grounded grid configuration with large 50k resistor on grid removes any voltage gain or effect in schematic to beocme small or very small. But if the design is intended to be like this, just adding a small touch of extra sound from second triod then I don't have much to say. Hello thank you for your responses looking like that plates together with 6j6. Here is a load line design for a fully parallel (i.e. plates and grids tied together) 6J6 preamp. Watch the high frequency rolloff. This tube tends to oscillate at RF with the cathodes above ground. Choose a grid stopper that limits the upper rolloff to somewhere not too far above 20kHz. Has anyone built a preamp yet? Grid stopper? 5K?